Author, Melanie Cusick-Jones sent me an ecopy of her book Hope’s Daughter. 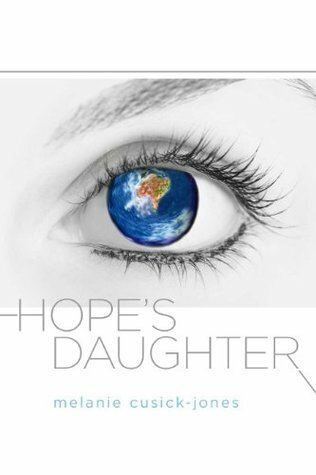 I really rather enjoyed Hope’s Daughter. It is a romantic YA sci-fi novel. However, the emphasis should be very strongly placed on romantic. For much of the book it is the primary focus. In fact, the plot doesn’t really travel far from the romantic for a good 50% or so of the book. There are just sci-fi hints dropped in amongst the romance. It’s also a very YA romance—lots of angst and self doubt and then lots of complete dedication to that same love. But it’s still enjoyable. I adored Balik. He made a marvellous male lead. I vacillated on Cassie. Sometimes I loved her and other times I kind of wanted to slap her, mostly during her internal waffling moments. We spend a lot of time in Cassie’s head, listening to her self-doubts. Most of which are unfounded. Together, however, they made a strong dynamic duo that I was more than happy to follow. The plot itself is an interesting one. However, I had two personal complaints on that front. One, there were a lot of convenient solutions to problems presenting themselves. It would be hard to go into details without spoilers, but answers seemed to come to Cassie instead of the other way around. Two, I had a hard time believing the twist with her ‘father.’ It required an unexplained and otherwise impossible change in someone that just didn’t feel plausible to me. I get what the author was trying to do here in showcasing the power of love, etc. But it rang pretty false for me. Neither issue really detracted too much from my basic enjoyment of the book though. It had a fairly slow start and there are a number of info-dumps, but it reads well, keeps you interested, and leaves you open to more. All in all, I’d be more than happy to recommend this book to young sci-fi lovers. This entry was posted in books/book review, Challenges and tagged #indiefever, book review, challenges, Indie, sci-fi, YA on March 20, 2014 by admin.